Posting content on behalf of clients in different regions, eg you have a remote worker offshore, and they need to post to a US based SM site, but are blocked as the site tells them they’re in the wrong country. The same could also happen for different regions within the USA. The trick to prevent your IP address from being banned is to legally send your intelligence gathering queries from lots of different IP addresses. 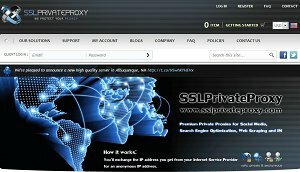 The Trusted Proxies Proxy Server Cloud provides you a solution. It lets your automated software to rapidly and anonymously send your queries from hundreds and thousands of different computers. The Social Media sites then just see legitimate queries coming in from lots of different computers so it looks just like regular traffic, so there are no bans, and your software can carry on working. Get started now by clicking the Free Trial button opposite. Getting a Proxy Server in the country or region you need to post in will allow your remote workers to do their jobs and keep the Social Media sites happy too. It works by changing the originating IP address of your web traffic to the IP address of the Proxy Server. When your target website looks up the geographic location of the IP address from a commercial “Geo-IP Database” it sees that the IP address – and hence your traffic – is coming from the correct country/region, and so allows the traffic through without giving you an error message. International Geo-Proxy Servers and US Metro Area Proxy Servers from Trusted Proxies provides you with a solution. With the International Geo-Proxy Servers you can surf the web as if you are in another country, and you can choose from scores of countries. It works the same way for US Metro Areas. You choose the US Metro Area you want from thedozens of US Metro Areas available, and your IP address is replaced with one from that US Metro Area. However, please note, “Geo-IP Targeting” and Geo-IP databases are not 100% accurate. At the country level they are 95% accurate. At the regional level, accuracy varies from 50% to 80%. Consequently we cannot guarantee city center precision, and instead refer to the “US Metro Area” which could be up to 50 miles (80 kms) of city centers, although it usually within 20 miles or less. This is usually adequate for most applications.